I bought the Flash Red five-door ‘X’-registered 6N2 Polo GTI in 2010 with 83,000 miles on the clock just after we moved house, as I had to commute back and forth to work. It was certainly no minter but I have had a soft spot for the Polo GTI for years and always wanted one. It soon became apparent that the gearbox was on its last legs, and after a bit of research, I found out that it was actually on its third gearbox, soured from a diesel Polo! (6N2 Polo GTIs are known to have gearbox issues.) I had toyed with the idea of building a track car, so made the decision then to use it on-track instead. After sourcing and fitting a CWX gearbox from the 100bhp 16V 6N Polo, Raceland exhaust manifold, cone filter and a set of coilovers, it was ready for its first outing at Knockhill – a 130-mile hike from my home. The Polo was still road legal at this point so I had to be careful when I was out on the track, and couldn’t drive it like I had stolen it as I still had to drive home. That first track day was really great. The GTI handled really well, even though it was on standard road tyres. I had a few spirited runs against a Golf VR6 and surprisingly the Polo did very well against it on the track. From then on I was hooked! My second track day was also great fun, until I started to get blown into the weeds on the straights by bigger cars. 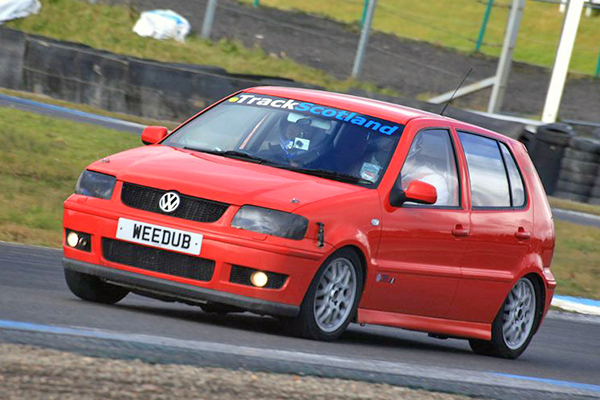 Knockhill is only 1.3 miles in length and is a ‘power track’, so the Polo was never going to cut it with the big boys. The majority of cars that were attending the track days then were Subarus and Evos. As I was working to a budget, I would have to scour eBay and the local breaker’s yard for parts to try and save on cost. I did quite a lot of research into what parts would fit and what would not, but the internet can be a minefield and a few parts were purchased that did not fit. Wanting to keep up with the track days while I was building the car, my mate suggested we find another runaround, so after scouring the local paper we found a Renaultsport Clio 172 Cup that was only running on three cylinders and managed to buy it at a knockdown price. A spot of fault finding and £70 later, a new injector was fitted and it was up and running. Meanwhile, I had managed to source a Volkswagen 1.8T AUM engine and five-speed 02J gearbox, loom and gearshifter from a mate of a mate who had written off his MK4 Golf GTI and had decided to break it. I gave the engine a freshen up with a new timing belt, water pump and aux belt and got down to the task in hand of trying to fit it. I offered up the engine and gearbox to the engine bay and measured up for mounting the Golf engine mounts. After a bit of fabrication work the engine and gearbox was in place. Using a dogbone mount from a Golf R32 and a custom subframe mounting bracket the hard part was complete, or so I thought! Driveshafts were going to be next and by good luck I found a new set of Ibiza Cupra R shafts on eBay with a starting bid of 99p and no reserve! Five days later I won them for £1.99! I was delighted. I also had to source 100mm gearbox cups from the Ibiza or a Mk 2 Golf and change out the 108mm ones that the Golf used. Once again eBay was kind to me and I managed to find a pair. I removed the Ibiza outer CV joints and fitted new Polo GTI ones and then offered the shafts up to the newly refurbished hubs. The driver’s side shaft fitted no problem but the passenger side shaft was too long. After 10 minutes with a measuring tape, I cut the shaft in half and removed 50mm from one end and manufactured a sleeve. I welded it together and hey presto, it fitted! The Golf gearbox was hydraulically operated, while the Polo gearbox was cable operated, so I sourced a pedal box from my local breaker’s yard out of a Skoda Fabia and swapped it out for the Polo one. Boost piping was next and I bought a universal 63mm hardpipe kit from eBay and set to work installing it using red silicon hose to join the lengths of hard pipe. No easy task as a lot of cutting away at the front bumper was required to fit the front mount intercooler. The front bumper is basically now just a removable skin. I manufactured my own dash and fitted aftermarket gauges and switches along with a pair of fuse boxes. Demon Tweeks supplied the majority of these along with a battery isolator switch and push-button starter panel. The wiring loom was never going to be easy as I’m no whiz at electronics, so I decided to go for the MBE 992 fully map-able plug-and-play system that Qpeng supply. After discussion with Ben Leach from Qpeng on the spec of my build, I sent him the engine harness that I had and Qpeng converted it to a standalone system. It took about half a day to fit and all the feed wires to the aftermarket gauges, fuel pump, shift light, and tacho etc were marked up for ease of connection. Front brakes are from an Audi S2, twin-pot calipers on 288mm Tarox drilled and grooved discs with Mintex M1155 pads to keep the 15″ wheels. Rear brakes are standard Polo GTI calipers with Tarox drilled and grooved discs with Mintex M1155 pads. Finally, the side windows were removed and fitted with polycarbonate items to save weight. It took me about eight months on and off to build the car, and I had it down to Knockhill in the summer of 2012 to try it out. The engine and turbo were stock at that point with original injectors, and the engine was 150bhp with the addition of a remap from Qpeng. I never had it rolling-roaded, but estimated the power to be around 200bhp. With it being stripped down it weighed in at 900kg. Over the winter of 2013/2014, I carried out extensive alterations with the addition of larger turbo, injectors, exhaust manifold, VR6 throttle body, Quiaffe differential, and a lightened and balanced clutch. I am aiming for around 300bhp. My first track day this year was on Sunday 23 February and was a chance to give the car a shakedown. It was a success. I had an issue with blowing boost hoses off a few times in the morning as the Polo was running around in excess of 2 bar (gauge-only reads 2 bar and the needle was round to the stop). After a few adjustments, I got it down to 28psi which is safer but still high for a stock unforged engine. The Quaiffe LSD worked a treat on the damp track and is a great improvement over the standard open differential. The car was quicker in the corners and even outdragged an E60 M5 on the short straight from Clarks to the hairpin! The driver and his passenger came over to me in the Paddock just after the session with a look of amazement and congratulated me on the build and asked for the low down on my modifications. I also plan take her to a rolling road to see exactly what she is putting out. The car weight has risen to 940kg with the addition of a six-point OMP bolt-in roll cage (supplied by Custom Cages), so I am looking at a power-to-weight ratio of just over 300bhp per tonne! I have just purchased another engine for the Polo from an Audi A3 Quattro and have just started stripping it. I am forging the internals and fitting an ADR head from a normally-aspirated 1.8 20V Golf as it has larger ports and more aggressive cams. The turbo is going to be a TD06 from a Subaru and the power figure I’m aiming for is 450bhp! Hey mate, you still got the Golf engine as I’m keen to make a Polo track car too for Knockhill? I have sold it to my mate. He runs it now and has the spare engine. I bought a Mk 2 Golf TFSI. Cialis is very effective drug but I have a rather unpleasant effect – bloating for a long time. I have stomach problems from time to time, moreover, almost always I get diarrhea when I am treated with antibiotics. Who will have the decision to limit these effects? Thank you.